This email, which I received from Joe Gurrera, the owner of Citarella, required setting the alarm for 3:30am, grabbing two cups of coffee and driving the hour to the Fulton Fish Market in the Bronx. Visiting the new Fulton Fish Market was something I have always wanted to do, mingle with the best purveyors of the freshest and best selection of fish, just hours before it arrives at stores and restaurants in preparation for the day’s fare. The history of Citarella dates to 1912, when a small fish shop opened in Manhattan. Over seventy years later, in 1983, Joe Gurrera purchased the shop and Citarella was born. Joe’s passion for fish started when he was a small boy venturing, in the dead of the night, to the original Fulton Fish Market. It was during these nightly excursions that he educated himself on the various fish and, more importantly, how to choose the best of the best. Until recently, Citarella had six retail locations, three in Manhattan and three on the East End of Long Island. Earlier this year, Citarella opened its inaugural Connecticut store, its first with an attached wine store. To oversee the wine program, Gurrera hired Sommelier Mary Schaffer, the owner of Napa & Company, a perennial contender for the best restaurant in Connecticut, and consistently praised for its wine program. 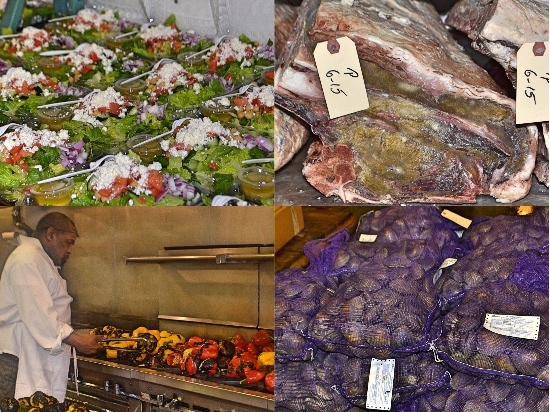 Schaffer and Gurrera invited CTbites to visit the new Citarella and the Fulton Fish Market to gain a deeper understanding of the passion that is required to deliver the best produce, fish, meats and prepared food to its customers. The history of the Fulton Fish Market begins in 1807 when it originally opened near the Brooklyn Bridge in lower Manhattan, serving fish as well as other goods. In 1822, the fish purveyors moved to the South Street location, between Fulton and Beekman Streets. The market was located in two buildings, the “Tin Building” and the “New Building,” which opened in 1939, three years after one of the original buildings slid into the river. Fish arrived around midnight and the activity continued through the wee hours of the morning. After 180 years in downtown Manhattan, the Fulton Fish Market moved to its new, state of the art facility in the Hunts Point section of the Bronx in 2005, with 400,000 square feet of space, representing the largest consortium of seafood wholesalers in the country. It is estimated that about one-third of New York’s entire fish demand, and millions of pounds daily, is handled by these businesses, many owned by the same family for multiple generations. The massive structure houses every imaginable form of fish and seafood. Upon entering, you are overwhelmed by the size, the activity and the speed by which transactions occur. A wide center aisle separates the two sides into streets. 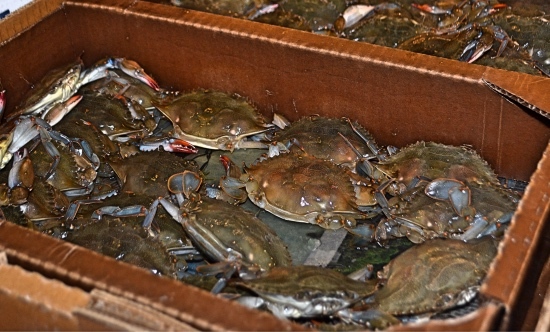 Boxes of crabs, snapper, bass, calamari, flounder and turbot are stacked six high, whole halibuts are presented on ice, and whole tunas lie next to those already filleted; soft shell crabs are neatly nestled like little soldiers in their boxes, lobsters climbing over each other and clams and oysters are encased in webbed bushels. The smell of the sea is everywhere. Buyers and sellers first hug and then negotiate for the best price for the selected products. After the deal is completed, cups of espresso may be exchanged, friendships cemented generations ago continue each night, and then the packing and delivery begins, when speeding fork lifts move throughout, picking up orders and shooting down the center aisle to the loading docks. It is organized chaos mixed with ballet. Once Gurrera’s buyers purchase the daily orders, the bounty goes to either the Meat Without Feet prep area for filleting and packaging for restaurants or to the building next door, which houses Citerella’s distribution center. Here, the fish is trimmed and prepared for retail sale at one of its seven locations or sent to the adjoining Commissary. 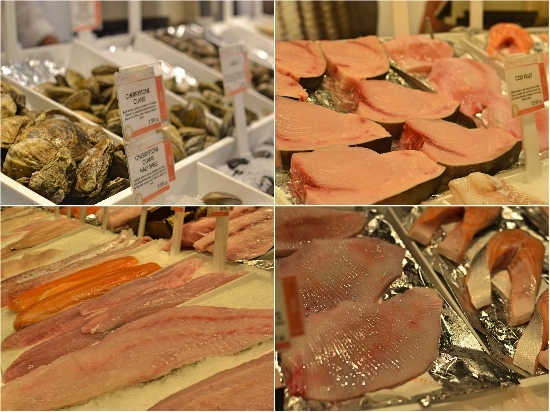 The filleting of fish is joined by meats, which are trimmed, dry-aged, and cut for the stores. The enormous kitchen, affectionately named The Commissary, prepares millions of packaged products and meals per year, from salad, to soups, to cakes and cookies, each are prepared from scratch. On the day I visited, the Commissary was roasting dozens of peppers over twelve feet of open flames, the Chicken Française was being removed from the ovens, cookies and cakes were being frosted and decorated, imported cheese were being grated and packed, fruits and vegetables were being juiced and salads were being assembled. Once packed, they are delivered to one of the seven Citarella stores. The newly opened Greenwich location is bright and airy. Upon entering, the colors of the produce grab the eye and the wonderful aroma of the ripe fruit hangs in the air. As you work your way through the store, you can choose from soups, pizza, pastry, cheeses, sushi, pastas and sauces, and the aged meats from the Bronx. In the rear is the full selection of the fresh fish and seafood that left the Bronx that morning. Grab a prepared meal or a basketful of ingredients to make a great meal at home; the dock to kitchen was now complete. I learned a tremendous amount from my visit to the Fulton Fish Market, my time with Citarella’s owner, Joe Gurrera and I gained a deeper appreciation for the entire process of choosing the freshest fish, meats and ingredients that Citarella and Meat without Feet share with the home cook and many of the best chefs in Manhattan and the tristate area.